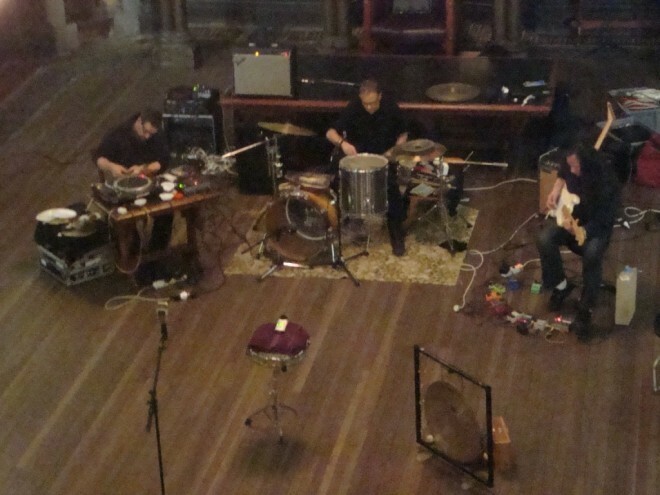 PERLONEX is Ignaz Schick (turntables, live-electronics), Jörg Maria Zeger (electric guitars), Burkhard Beins (percussion, objects) and occasionally Charlemagne Palestine (grand piano or church organ, voice). A live-electro-acoustic trio, PERLONEX was founded in late 1998 and has performed and toured in Europe, Asia, Australia/NZ and North America extensively since then. Ranging from prominent contemporary music festivals to underground noise/punk clubs, from art galleries to obscure improv backrooms the wide variety of venues they have played marks out the musical spectrum of the group. Through the interplay and friction of gradually shifting layers of sound, sonic interferences, interwoven loops and hidden repetitive structures PERLONEX is plumbing the depth of a rather complex sound material.